The Pink Panther first appeared on film in the 1963 Blake Edwards movie, The Pink Panther, starring Peter Sellers as the clumsy French detective, Inspector Clouseau. In the film, the term “Pink Panther” referred to a large diamond with a flaw at its center resembling a pink pouncing panther. This was the inspiration for the character of the same name. The Pink Panther starred in the animated opening and closing for the initial movie, set against jazzy music by Henry Mancini. The character is almost completely silent in the movie, preferring to rely on slinky pantomime-like moves. Audiences liked him so much that his animators, DePatie-Freleng, were asked to create a series of animated short films. The first animated film, 1964’s The Pink Phink, won the Academy Award for Animated Short Film. Since then, more than 100 animated shorts were created, entertaining moviegoers until 1981. Pink Panther also appeared in all of the Pink Panther movies, the latest in 2009, starring Steve Martin. In 1969 The Pink Panther made his first appearance on television in his own show. Two animated short films made up each episode, which were thirty minutes long and shown on Saturday mornings until the show went off the air in 1979. In 1980, United Artists Television put together a new half-hour show using the theatrical shorts and new cartoons and syndicated it to TV stations. This lovable character also had his own comic book, published by Gold Key Comics beginning in April of 1971. Eighty-seven issues were released and the series ended when Gold Key closed in 1984. 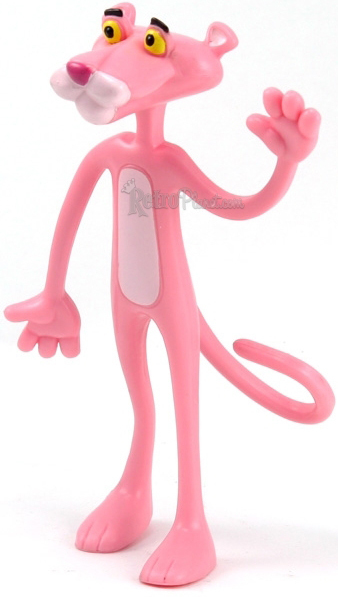 Like many retro characters, Pink Panther’s popularity resulted in a great deal of merchandise production and advertising. Remember the catchy tune that ran in the Pink Panther cartoons? The first product advertised, by the way, was a Post breakfast cereal called Pink Panther Flakes in 1971. Post had been a sponsor of the show and created the cereal as a tie-in. Since 1980, Owens Corning has used Pink Panther to sell fiberglass insulation, and he became the mascot for their Basement Finishing System. In 2001, the character became the mascot for Sweet’N Low artificial sweetener, later sharing advertising duties with Regis Philbin. For nearly 50 years this panther has entertained Americans and the international audience. Did you watch him as a kid? Share your memories.